Grove Hill City Hall is located at 111 South Church Street, Grove Hill AL 36451; phone: 251-275-3153. Photo: Alston-Cobb House, ca. 1854, 120 Cobb Street, Grove Hill, AL. 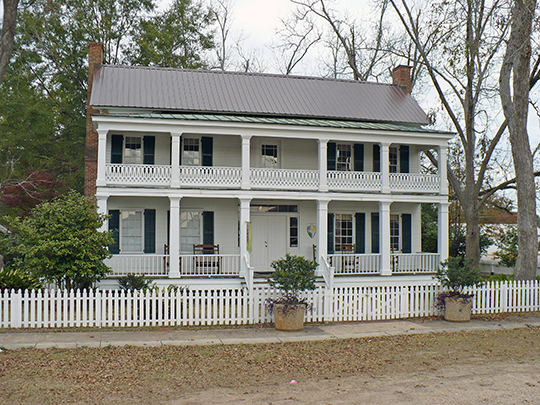 Listed on the National Register of Historic Places in 1979. Photographed by User:Altairisfar (own work), 2008, [cc0-by-1.0 (creativecommons.org/publicdomain/zero/1.0/deed.en], via Wikimedia Commons, accessed April, 2014. Once inhabited by Choctaw Indians, the area that was to become Grove Hill saw its first white settlers arrive in the early 1800s. Located near the center of the county (U.S. 43 & 84 crossroads) Grove Hill was selected as county seat in 1850, but was not incorporated until 1929.